Shale gas is a natural gas, which is extracted from shale reservoirs by drilling vertical and horizontal wells and using hydraulic fracturing to stimulate gas production. Shale rock is the type of subsurface formation of clastic and organic origin, deposited at the bottoms of the seas, deep water basins, lagoons and lakes as a result of simultaneous sedimentation of clay particles, carbonates and sapropel with organic residues (plankton, plants) under limited circulation of water and air. Accumulated organic- mineral mass was gradually transformed into solid sedimentary rock containing 15-40% of organic compounds. The first deposits of shale were formed more than 1 billion years ago in the Precambrian period. About 40% of all shales were formed in the Paleozoic era, 30% – in the Mesozoic era, and 25% – in the Cenozoic era. The deposits of shale usually form layers of several meters in thickness. However, there are also shale deposits with the total thickness of up to 600 m of mixed layers of shale rock and sedimentary rock. The production potential of shale deposit depends on the amount and quality of organic compounds and on the level of their thermal maturity. The gas production potential of the shale rock is evaluated based on the content of kerogen (organic carbonaceous matter). The most thermally mature shale rocks deposits contain the kerogen of the third type with the potential of producing “dry gas” (more than 90% of methane) . Less thermally mature shale rocks contain the kerogen of the second type and have the potential of producing gas with condensate additives. The least thermally mature shale rocks contain the first type of kerogen and have oil production potential. Thermal maturity means the degree of heating of the bedrock during the process of converting kerogen to hydrocarbons. The amount of recoverable shale gas in the reservoir is directly proportional to the thickness of the shale layer. Thus, thermally mature and thick shale layers are the most attractive for production. They usually belong to the Paleozoic and Mesozoic era, in particular, Permian, Devonian, Silurian and Ordovik periods. There is a range of geochemical parameters that determine the conditions for shale gas extraction and consequently the cost of produced natural gas. The presence of clay in the tight sands lead to energy absorption during hydraulic fracturing and significantly affects the cost of extracting because of increased demand for chemicals. The most attractive for production are so called ’fragile’ shales containing large amounts of silica dioxide, which contain natural fractures and cracks, lowering the pressure needed for hydraulic fracturing. 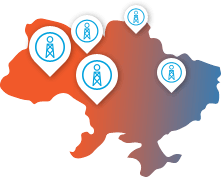 There are two major deposits of shale rocks in Ukraine with the potential of natural gas production, namely Lviv-Lublin basin on the west (extractive shale gas reserves are estimated at the level of 1,47 trillion cubic meters) and the Dnieper-Donets basin on the east (extractive shale gas reserves are estimated at the level of 2.15 trillion cubic meters). On the Oleska area the prospects of gas production are associated with the deposits of Silurian shale within Lviv Paleozoic deflection. On the Yuzivska area the prospects of gas production are associated with shale gas-bearing layer of Lower and Middle Carboniferous.